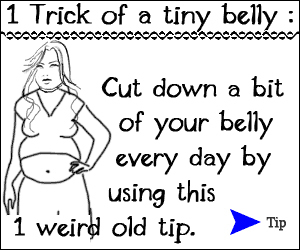 (NaturalNews) Over the last several months, the LA Times website and other mainstream media outlets have been running ads featuring text with messages like, "1 Trick of a Tiny Belly: Cut down a bit of your belly every day using this 1 weird old tip." A Consumer Wellness Center investigation (www.ConsumerWellness.com) has revealed the ad lures web surfers into a deceptive "fake news page" designed to trick people into agreeing to misleading offers that may result in hundreds of dollars being charged to their credit cards. The "tiny belly" ads (https://www.naturalnews.com/images/Tiny-Belly...), take surfers to any one of multiple fake news sites that appear to be legitimate news sites but are actually deceptive marketing pages. One such fake news page dubbed "Health News" features apparent news video footage from "Fox35," an AccuWeather report, an apparent testimonial and a collection of user comments which appear to be completely fabricated. The "Leave reply" section is "closed due to spam," says the fabricated advertorial page. Virtually everything on these fake news pages is fabricated. But what the page doesn't reveal is that virtually every element on the page -- the article, testimonials, right column ad, columnists, and so on -- directs visitors to do one thing: Agree to a free trial of Acai Max Cleanse. This free trial is described as a great deal: "Use our exclusive promo code ACAI to pay just $3.87 shipping!" And underneath this "free trial" promo is a time limit: "Note: Free Trials expiring on February 18, 2011" (or whatever date tomorrow happens to be, since this note changes every day). But this Acai Berry Diet free trial isn't just $3.87. In fact, it could end up costing you hundreds of dollars charged to your credit card. Once you sign up for what you think is a "free trial" costing you just $3.87, the Acai Berry Diet company will charge your credit card $149.95 seven says later for what it calls a "Membership Fee" in the small print at the bottom of its web page. The small print claims this is a "non-refundable one-year membership fee." Following that, you will be charged $12.95 each month for a "fresh monthly shipment" of their acai product. Even if you cancel the monthly shipments, after seven days you are not allowed to refund the $149.94 "membership fee." The total cost to you after 12 months is $305.35. If you cancel the program after the first shipment, you will still have paid $162.90 for a single shipment of their acai berry product. It gets even more expensive if you sign up for their "free trial" of Natura Cleanse which is offered under nearly identical terms. Their website text claims, "Click Here To Get A Free Trial Of Natura Cleanse. Use promo code COLOSHIP to get $1.95 shipping!" But once again, the small print explains that by accepting the free trial, your credit card will be charged a $149.95 membership fee followed by a monthly fee of $12.95. This could cost you another $305.35 over twelve months. If you sign up for both the Acai Max Cleanse trial and the Natura Cleanse trial, it will cost you $610.70. While the company says you can call them to cancel your shipment, comments from enraged customers on the 'net reveal that this is often difficult, if not impossible (see below). When you enroll in our membership program ("Program"), we will charge the card the card you provide the activation fee specified on the order checkout page and send you a trial supply of Acai Max Cleanse. If you contact customer service to terminate your enrollment within seven (7) days of the date that you enroll in the Program, you will not receive any additional product and you will not be charged anything else. Your enrollment date is the date that you submit your order for the trial product. If you do not cancel within seven (7) days of the date that you enroll in the Program, we will charge the same card you provided at enrollment the non-refundable one-year membership fee of $149.95 ("Membership Fee"). Then, beginning about thirty-two (32) days after we charge the Membership Fee to your card and every thirty (30) days thereafter, we will send you a fresh monthly shipment of the product and charge your card $12.95 ("Monthly Charge") when each supply ships. You can cancel monthly shipments and avoid further Monthly Charges at any time by contacting customer service. What do people say about this acai berry scam? These scammers are not merely giving acai berries a bad name; they are engaged in highly deceptive acts that in my opinion qualify as credit card fraud. Here's a case where some FTC or FDA intervention might be welcomed because the offending company is engaged in highly deceptive advertising. Their outrageous claims for the weight loss potential of acai berries are simply not true. While acai is a fantastic source of antioxidants and other plant-based nutrients, it's no weight loss miracle. Actually, the FTC is already involved to some degree. The agency filed suit in August of 2010 against one operator of the misleading ads, and this has resulted in a restraining order (http://www.ftc.gov/os/caselist/1023028/index...). The title of this regulatory action is: "Federal Trade Commission, Plaintiff v. Central Coast Nutraceuticals, Inc., iLife Health and Wellness, LLC, Simply Naturals, LLC, Fit for Life, LLC, Health and Beauty Solutions LLC, Graham D. Gibson, and Michael A. McKenzy, Defendants. (United States District Court for the Northern District of Illinois)"
An article about this was even carried on LA Times.com, no less! But the suit didn't stop the widespread use of these ads across numerous mainstream media website. Even today, the ads are clearly visible on many MSM websites. I verified the presence of these ads on WashingtonPost.com just three days ago (and took a screen shot, of course). These deceptive "news" web pages are designed to mislead people into thinking they are a credible news source when, in reality, nearly every element of these pages is designed to funnel people into signing up for a "free trial" of their product. And the so-called "free trial" is actually a gimmick to hit their credit card with a $149.95 "membership fee" whether they receive any subsequent product or not. The whole thing is precisely the kind of scammy, dishonest and misleading marketing of superfoods that we need to see halted. These scammers give a bad name to the natural products industry. These are obviously not honest, ethical natural health advocates who really care about nutrition -- they are clever scammers with slick websites that trick people into handing over their credit card details that could cost them as much as $610.70 in charges they weren't expecting. Help us shut down these acai berry scammers. Their continued presence on the internet is a danger to consumers and a disservice to the reputation of acai, which is a legitimate superfood offering many health benefits to consumers. The best way to stop these scammers may be to contact the companies distributing their advertising. Many of their ads are broadcast via technology developed and hosted by a company called Zedo (www.Zedo.com), headquartered in San Francisco. Zedo is an ad platform engine that runs the ads behind many of the most popular newspaper websites in the world. The company has been strongly criticized in the past for carrying ads for both misleading advertisers as well as malware ad providers who use ads to infect the computers of people who browse the internet. "We used to but no longer sell our technology to people whose primary business is to do this misleading advertising," Zedo CEO Roy de Souza told NaturalNews. "We now sell technology only to reputable websites especially newspaper sites." ...Sites like LATimes.com and WashingtonPost.com, it turns out, which have been carrying the scammy acai berry ads for months. NaturalNews attempted to contact LATimes.com about this issue several times over the last several months, but received no reply. Zedo's public relations spokesperson told NaturalNews that they "actively participate in many industry boards and groups to prevent and fight against malvertising. Unfortunately, the acai berry and similar ads don't qualify as malware or malvertising." Technically, that's true. The ads don't inject malware into your computer. They merely direct you to misleading websites engaged in extremely deceptive and dishonest marketing practices that cause people to receive unexpected charges on their credit cards. Zedo says it wants to stop illegal or misleading advertising. "ZEDO is 100% against affiliate ads (such as Acai berry diet ads) and similar ads with misleading claims," de Souza told NaturalNews. "In particular ZEDO is against ads that click through to fake news sites or advertisers that charge credit cards monthly without explaining this to the customer. This is all bad advertising and it must be eliminated by the FTC." But Zedo itself appears to be allowing its ad server technology to serve these ads, as long as its customers (newspaper websites) allow it. Says Zedo's P.R. spokesperson: "The ZEDO Ad Server has many customers, all who sell and offer many types of campaigns. While some of them may be less reputable than others, we can't prevent customers from selling to companies like the Acai Berry companies, as long as they're not breaking the law, or our terms and conditions." From that answer, however, it appears, Zedo could alter its terms and conditions to forbid its customers from using Zedo technology to serve up scammy, misleading ads that point people to fake news sites to mislead consumers into handing over their credit cards to get charged large dollar amounts they never expected. Zedo takes the position that it can't really do anything about these scammy ads -- that it's the fault of the mainstream news websites that choose to run these ads. They have a point, actually: The decision on which ads to run is a local decision, made by the newspapers. They are merely using Zedo's ad server technology. Note: On the day we decided to publish this article, we checked the LATimes.com website and it appears that these scammy ads have been removed. We suspect this is because we have been investigating this story, and word is probably getting out that there will be increased scrutiny on this. But as of today, we could no longer find these scammy ads on the LATimes.com website. We monitored LATimes.com for many months and saw the scammy acai berry "tiny belly" ads on their website month after month (with screenshots). It would be good news, indeed, if they have now decided to remove them. Watch NaturalNews for updates as this story develops. Ideally, we would like to hear back from the LA Times that they have taken steps to ban these ads from their website. As I mentioned elsewhere, we have been trying to contact the LA Times for months about this issue and received no reply. Is Zedo partially responsible for serving up these ads? The unfortunate truth of the situation is that, for Zedo, the scammy ads are hosted on their Zedo.com servers, meaning a court of law could very easily find Zedo to be complicit in the "aiding and abetting" of these blatantly misleading credit card scams. "ZEDO has acted and will act to prevent this. We now sell technology only to reputable websites especially newspaper sites," says de Souza. "These sites have also got much better at spotting and refusing to sell to low quality advertisers. For quality newspaper sites these types of advertisers probably represent a tiny percent of their revenue and that is declining." From the comments we received from Zedo, the company clearly doesn't believe that policing these ads is its job. "This is all bad advertising and it must be eliminated by the FTC," says de Souza. He has a point that could be debated, of course: The Zedo system is a technology platform used by other companies such as newspaper sites. But the real issue here that could work against Zedo is the fact that they host the offending ads from their own web servers. In my experience, that makes a lot of difference in the eyes of justice. If you're serving up the scammy ads, you may have some measure of responsibility for taking steps to make sure those ads aren't ripping people off by linking people to credit card scams. This indicates that, in addition to Zedo, Doubleclick is also involved in the serving up of this particular ad. Doubleclick is, of course, owned by Google. Will the FTC do more? Personally, I blame sites like LATimes.com for allowing these ads to prominently appear on its site, month after month, even after being warned by folks like me. I blame WashingtonPost.com and the other websites who appear to be looking at the bottom line income from these ads and concluding, "We're making some bucks on these ads!" Don't these online newspapers ever make a concerted effort to filter out misleading ads and protect their readers? In my view, these newspaper websites are at least partly to blame in failing to remove these spammy, misleading ads from their websites. It's almost as if they have no respect for their own readers and don't mind if those readers get scammed (at least, that's how it appears from the research I've done). The LA Times has been carrying these scammy ads, powered in part by Zedo technology. I find it astonishing that the LA Times has, month after month, published these ads that scam readers through deceptive practices. Perhaps they have now removed them, but until very recently, these ads were very prominent on the LATimes.com website. In all fairness, Google handles probably millions of advertisers and it must be difficult to weed out all the scammers trying to exploit Adwords for their own nefarious purposes, but let's hope Google can do something to ban this particular advertising outfit. Perhaps the same argument of defense could be made for Zedo, too. What, exactly, is the responsibility of ad serving companies when it comes to protecting consumers from fraudulent advertising? These are questions that only the courts can decide. In the spirit of full disclosure, because Google has carried these ads, it is possibly that they may have inadvertently appeared on the NaturalNews site, as one of our ad boxes is served up by Google. However, we are actively banning advertisers quite frequently with Google, and if we ever see a scammy acai "tiny belly" ad show up, we'll ban the URL as quickly as we can. I expect to see a lot more coverage of this story in the weeks ahead. This needs to get national attention (and probably will). The LA Times, in particular, needs to clean up their ad network and get these scammy spammy hucksters off their website. The fact that these ads have run for so long on LATimes.com makes me question the ethics of the entire LA Times operation, actually. It makes me ask the obvious question: If so many of their ads are false and misleading, what are the ethics of their whole operation? Note: This article was written by Mike Adams as the executive director of the non-profit Consumer Wellness Center (www.ConsumerWellness.org) which seeks to warn consumers about health-related scams. You may reprint this story in its entirety as long as you place a clickable, visual link back to this page on NaturalNews, and you quote the Consumer Wellness Center as the source. Thank you.